It’s time to play a little catch-up. 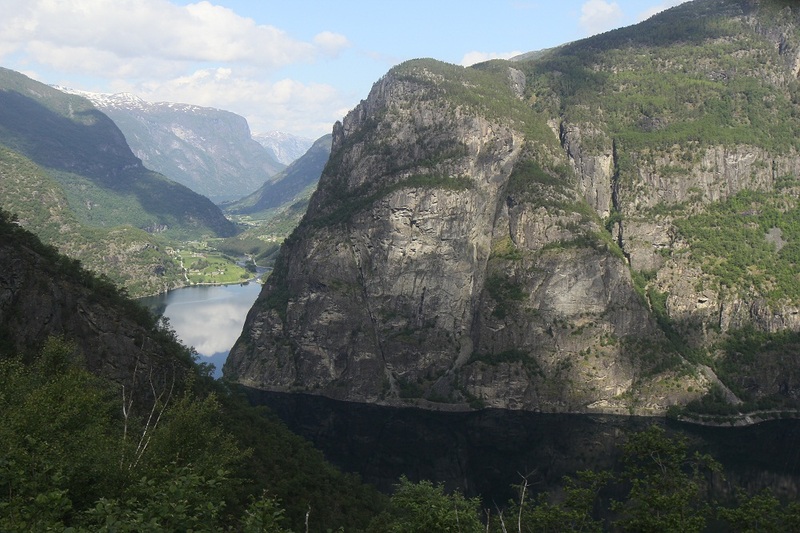 We left Oslo so long ago, passed through Flam and Bergen, and continued onwards again. Flam was insanely beautiful. It sits on a small finger off of the far end of Songen Fjord. There was a bit of a hitch getting there, but it all worked out in the end. We were shuffled off of the train due to a tunnel fire down the line, and onto some buses which took us the rest of the way, almost. The plan was to take the train to Myrdal, save some money by skipping the world-steepest train ride down the mountain valley, and instead hike to Flam. Now that we had been dropped off right in Flam, we had missed out on the valley all-together. I talked with the rail operator until we got a free ride up the valley, and then we hiked right back down again. The hike gave us time to take in scenery that went by so quickly on the train. All of the snow and glacier ice I saw from the plane comes down as waterfalls here. Lots and lots of waterfalls. It was almost too much, but they kept getting bigger and higher. I’m embarrassed at how my waterfall pictures I’ve had to edit out. Tired and spent from looking at too many waterfalls, we set up tent in a goat pasture for the night. Did Kate talk about Norway’s camping laws? In case she didn’t, there’s a word in Norwegian that translates to “all man’s land.” The law states that even through land may be owned, it still can’t be taken away from the rest of Norway. Unless there’s a good reason for keeping people off, such as raising crops or fencing in livestock, a stranger is within the law to walk upon and even setup camp on your property. And that’s how we’ve come to save so much on lodging here in Norway. A couple nights of camping was enough. Flam is indeed beautiful, but there is more to see. We hopped on an over-priced tourist boat that cruised down the Alusund Fjord and then back up the Narrow Fjord, but you won’t see any gorgeous fjord photos because that was when the rain began, and it hasn’t missed a day sense. Written by: matt on June 26, 2011.